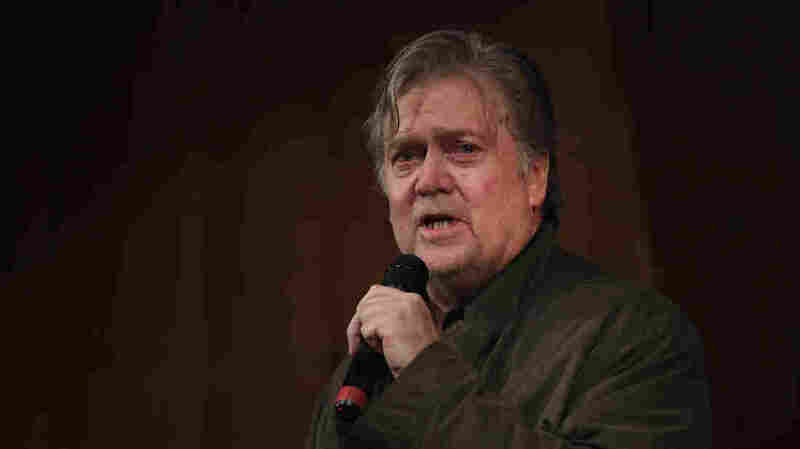 Bannon: 'It's A Season Of War Against The GOP Establishment' Bannon's speech at the Values Voter Summit wasn't overtly religious but he opened by reading from the Bible to make his case that the time was ripe for the type of crusade he wants to wage. Former adviser to President Donald Trump and executive chairman of Breitbart News Steve Bannon speaks at a campaign event for Republican candidate for the Senate in Alabama Roy Moore on September 25, 2017, in Fairhope, Ala. The sins many incumbents were guilty of, according to Bannon, weren't voting against the president's proposals or necessarily being insufficiently conservative. It was that many were too allied with Senate Majority Leader Mitch McConnell, R-Ky., and didn't speak out when critics of the president, like retiring Sen. Bob Corker, R-Tenn., dared to voice their concerns about Trump's leadership and temperament. "Right now it's a season of war on the GOP establishment," Bannon declared. Bannon's speech wasn't overtly religious, though he did begin by reading Scripture from Ecclesiastes 3 to make his case that the time was ripe for the type of crusade he wants to wage. And with the group of evangelical voters and political activists who attend the yearly event — at least some of whom believe God ordained Trump's election to bring about a reckoning in Washington and to return the country to its Christian principles — he found a receptive crowd. Since leaving the White House in August, Trump's former campaign chairman has returned to his post as chairman of Breitbart News and made it his express mission to purge the Republican Party through 2018 primary challenges to sitting members of Congress. His efforts are reportedly being backed by conservative hedge-fund mogul Robert Mercer and his daughter Rebekah. And ever since successfully backing Roy Moore in last month's Alabama special Senate primary as he knocked off appointed Sen. Luther Strange, who had benefited in millions of spending on his behalf from a McConnell-aligned super PAC, Bannon believes that victory was only the beginning of things to come. "A good man with good ideas can beat back any amount of money," Bannon said. "The most powerful thing is an authentic candidate." He admitted that some of his targets may not seem obvious. After all, those incumbent Republicans he singled out — like Wyoming Sen. John Barrasso, Nebraska Sen. Deb Fischer and Nevada Sen. Dean Heller — all have voted consistently with Trump. Even Heller, who initially opposed a White House-backed plan to repeal and replace the Affordable Care Act, fell in line eventually when a pro-Trump group ran ads against him. But for Bannon, that still isn't enough — though there is time to repent. "All of you folks that are so concerned that you're going to get primaried and defeated — there's time for a mea culpa," he said. "You can come to a stick and condemn Sen. Corker. You can come to a stick, a microphone, and say 'I'm not going to vote for Majority Leader Mitch McConnell.' "
Bannon particularly had his sights set on McConnell, signaling to the Senate's top Republican that there were plenty of people gunning to overthrow him, likening such a coup to the "Ides of March." Republicans, Bannon said — addressing McConnell directly — are "looking to find out who's going to be Brutus to your Julius Caesar." Bannon's pledge to take on incumbents is already giving some D.C. strategists heartache. Such intraparty fights, they worry, will only weaken what should be a favorable Senate map for the GOP, and ultimately distract from efforts to defeat Democrats. While Democrats have a chance to retake the House, Republicans have only a two-seat margin in the Senate they can easily grow given a number of vulnerable Democrats up for re-election in red states. That's where Bannon should be focusing his efforts if he wants to give Trump more manpower on Capitol Hill, some GOP strategists say. And for all of Bannon's crowing about Moore's win, the former Trump aide may not be able to replicate the same factors in other states. Bannon endorsed Moore late when he was already well ahead of Strange, who was also hamstrung by the circumstances of his appointment to succeed now-Attorney General Jeff Sessions by a scandal-plagued governor who's since resigned. Former White House national security aide Sebastian Gorka is an ally with Bannon in the effort to take on those seeking to block the Trump agenda and Gorka put their efforts in stark terms when he took the stage just before the Breitbart chief. "The left has no idea how much more damage we can do to them as private citizens, as people unfettered," Gorka warned. "2018 will be the crucial year. This is the year. Steve has declared war on the RINO class as have I and we must tell them we have had enough," Gorka added, using a pejorative in conservative circles for lawmakers who are "Republicans in name only" — as many in the room stood and clapped. Bannon and Gorka may seem like odd figures to address a group largely defined by shared religious beliefs. Bannon has previously declared that Breitbart was the "platform for the alt-right," which has ties to white nationalists. And Gorka has been plagued by claims that he has ties to extremist groups. However, this year's annual Values Voter Summit underscored just how deep the marriage between white evangelical voters and the Trump wing of the GOP really is. That's all despite the fact that the twice-divorced former casino owner who has struggled to talk about his own faith initially seemed like a less-than-perfect candidate for Christian conservatives to embrace. Nevertheless, Trump carried 80 percent of white evangelical voters last November, according to exit polls. Friday he became the first sitting president to address the summit, and during the weekend's events, Trump was heralded at nearly every turn. The biggest common thread Bannon, Gorka and other speakers emphasized wasn't necessarily about a shared Christian faith but a devotion to taking on the GOP establishment. And many attendees like Henry Allen of Shelby, N.C., agreed with that view. "They have for several years viewed us as insurgents, and we are the antithesis of what they want in this country," Allen said of McConnell and House Speaker Paul Ryan, R-Wis., who declined invitations to address the gathering. "We view them with angst too. This is the payback. They saw it in Alabama. And we're coming."